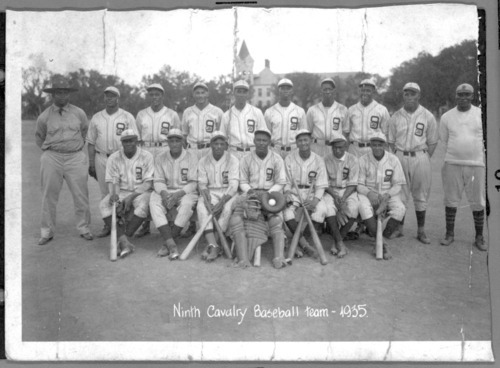 This is a photograph of Fort Riley's all-black Ninth Cavalry baseball team. The team's uniform features a large "9" on the left side of the jersey, with the abbreviation "CAV" nestled in the lower part of the number. Fifteen players are pictured in full uniform; another individual is dressed in casual athletic wear. The group also includes an individual in military attire.